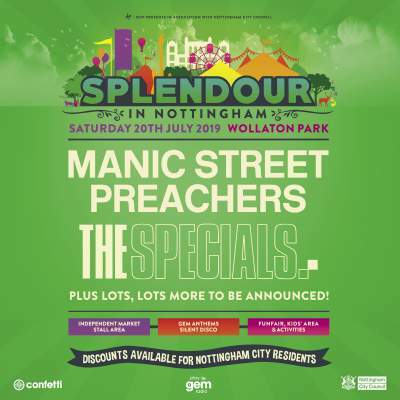 Manic Street Preachers and The Specials have just been announced as headliners of this year's Splendour Festival at Nottingham's Wollaton Park on Saturday 20th July. The two bands have an oustanding back catalogue with more than 20 combined UK top 10 hits, including If You Tolerate This Your Children Will Be Next and The Masses Against The Classes from Manic Street Preachers and Too Much Too Young and Ghost Town from The Specials! The announcement marks the first lineup for the award-winning festival's 2019 edition, with many more artists, comedians and entertainers to be revealed in the coming months. Tickets are on sale now! Buy your Splendour 2019 tickets here.